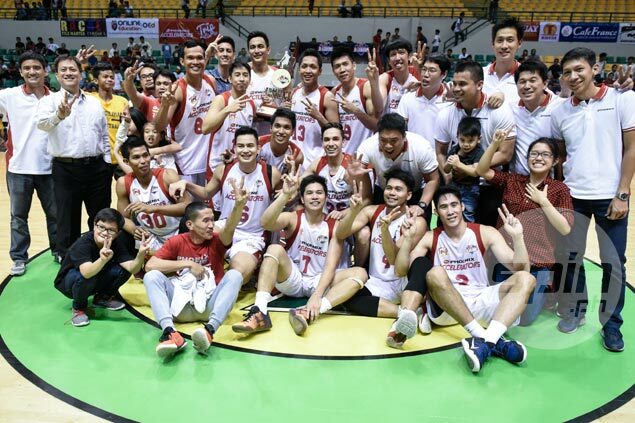 BIÑAN, Laguna — Phoenix completed a sweep of the PBA D-League titles, topping the Foundation Cup with victory over Tanduay, 87-78, in the series decider on Thursday at the Alonte Sports Arena. Mike Tolomia, the conference's newly-minted MVP, sealed the championship by sinking seven of eight free throws in the dying moments. He finished with a game-high 21 points. Mac Belo and Ed Daquioag added 14 and 10 markers, respectively, for the Aspirant's Cup champions who nearly squandered a 20-point lead. "Na-experience na namin before yung lalamang ng malaki tapos mahahabol. Kaya ngayon nag-stay together kami as a team sa depensa," said Tolomia, moments after their conquest of Tanduay. Phoenix doused a spirited late-game fightback by the Rhum Masters, who clawed back from 20 points down and came to as close as three, 66-63, on Rudy Lingganay's three-point play with eight minutes left in the final quarter. But the Accelerators pushed the lead back to 10, 75-65, on Tolomia's basket and went on to seal the title. Jaymo Eguilos paced Tanduay with 16 points and six rebounds. Reden Celda had 14, while Val Acuna and Gelo Aloliino added 13 points apiece in a losing cause. PHOENIX 87 - Tolomia 21, Belo 14, Daquioag 10, Escoto 9, Jose 9, Andrada 6, Mendoza 6, Inigo 5, Pogoy 4, Tamsi 3, Colina 0. TANDUAY 78 - Eguilos 16, Celda 14, Acuna 13, Alolino 13, Lingganay 10, Ferrer 7, Belencion 3, Gotladera 2, Javillonar 0, Mendoza 0, Santos 0, Tagarda 0. Quarters: 32-17, 48-34, 65-56, 87-78.